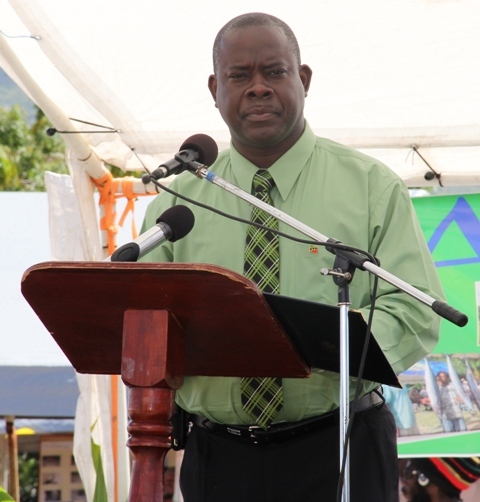 NIA-CHARLESTOWN, NEVIS (March 29TH, 2011) — “It is now the best time to reposition our Agriculture,” said Minister of Agriculture in the Nevis Island Administration [NIA], the Honourable E. Robelto Hector during last Thursday’s [Mar. 24] annual Agriculture Open Day ceremony. As he addressed farmers and employees within the Department and Ministry of Agriculture, Minister Hector, appealed to them to recommit their efforts towards the development and marketing of the island’s agricultural sector. The passionate minister, while underpinning the NIA’s commitment towards “ensuring the right programmes and policies are put in place to achieve diversity,” spoke at length about advances in cooperatives, fisheries, farming and agro-processing and the major improvements at the abattoir. Before issuing the final challenge, which encouraged Nevisians to purchase locally grown foods, the Agriculture minister publicly recorded his appreciation to the ministry’s partnering agencies and to the staff at the Ministry and Department of Agriculture. “As minister, I want to thank the agencies that have worked with us. I want to say to each and every one of you, we are indeed grateful for your support. “Permit me to thank the Ministry of Agriculture: the Director Mr. Amory, and for a moment, perhaps the first time in public, let me thank Dr. Daly for being my eyes, my ears, my voice at times. I want to say to you Dr. Daly, I couldn’t have chosen a better Permanent Secretary to represent me,” he said. With “the overwhelming majority of consumed foods in Nevis’ hotels being imported,” as highlighted by Minister Hector, Nevisians have a significant role to play in boosting the Agriculture sector. “I believe we have a unique opportunity, at this time, to position our Agricultural sector to reverse that position. “My advice to you my friends is to look for the label: the label which says promote, produce, preserve. It’s an indication that the buy local programme that was launched is indeed alive,” Minister Hector said. The two-day Agriculture Open Day event was held under the patronage of farmer Mrs. Althea “Sally” Parris and was held at the Charlestown Villa Grounds.